Selling customized products? Allow your customers to provide you with more details or custom information with the WooCommerce Product Input Fields module. 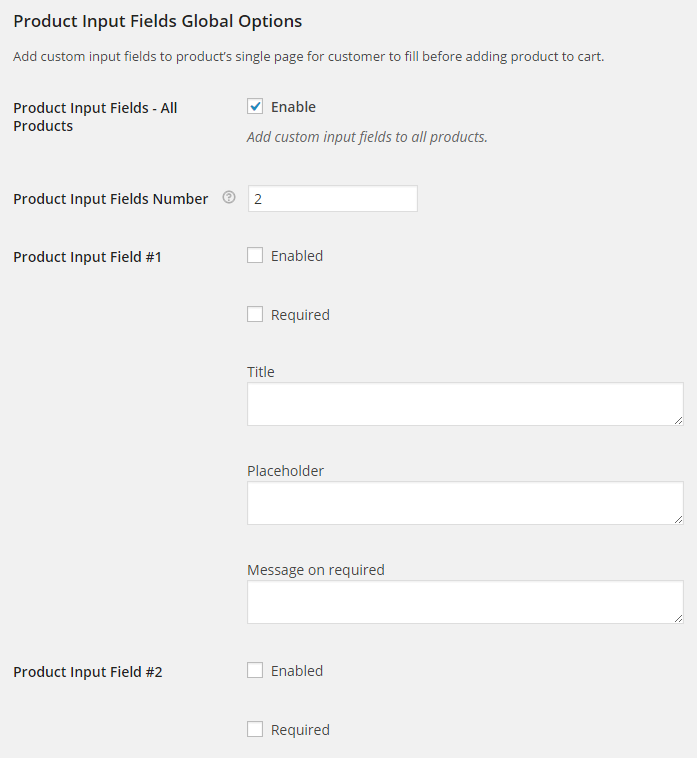 Enable input fields so your customers can give you more information before they add the product to their cart. Fields will appear on product’s single page. The input fields will appear on each product’s page. Simply enable the field in Booster’s settings, enter the field title, and a placeholder message to give your customers an example of what to enter. If more information is required in this field, enter text into the Message on required field that prompts your customers to provide more detail (i.e. “Please enter more detail” or “Please ensure you have filled out all fields”). You can set individual product input fields. First of all set default number of product input fields. This is only default value and you can change it in selected product’s edit page. After that visit selected product’s edit page. There you will find Booster: Product Input Fields metabox. The Product Field option needs to have a Textarea field so that customers can add more information. In addition to that the Product field as it is now is too short to add hardly information in it. Also, when you select “required” and you test it the page immediately refers back to the same order page without giving a reason why it did so. Otherwise the program is great! Regarding textarea and other types for input fields, as well as options for styling the fields – already on our task list, will add, however can’t say anything on deadlines. The required field does work. I did not have the required reason selected. Can’t wait for a “Select Option” list for product input fields. Do you have an ETA of this field type options? this feature is already in our to-do list. Can not say ETA. Let you know when it will be available. I’m using Product Input Fields for just one of my products (2 custom fields on it) and it works great when users select products from the website. My problem is that when I need to create a manual order using the WooCommerce\Orders\Add Order button… the custom input fields are not listed so I cannot fill in values for the custom fields for the manual order. … the custom input fields are not listed or available in any way that I can see. How can i see\add values to my product input fields in this way? I do not want to force my customers to have to do it themselves, they want me to correctly enter orders for them that I receive over the phone. – and I also have the plugin WooCommerce JetPack Plus 1.0.4 installed and active in my list of plugins (I did pay for it a couple months ago; before “Booster ” came around). Also, should I have “Booster Plus for WooCommerce” instead of “WooCommerce Jet Pack Plus”? How would I go about doing that? we added this feature to our to-do list, we let you know when it will be available. Hi I’m interested in making the product input field be a dropdown, instead of a checkbox or other type of field. Is there a way to do this? Not possible for this moment. We added this feature to our to-do list. We let you know when this feature will be available. where do you want to display them ? I have added a custom field to all products (a datepicker). Is there a way to have the date for each product selected show up on the product line in the cart and checkout, along with the other information (such as quantity)? As asked by another user here; how can we display custom fields with product increment button together? When I increment; it orders the same product; but it should be an individual product as I set in settings. So second one should ask for details of its own; instead it tries to sell same unit twice which doesnt exist after first one is sold. i have set a custom product field so users can “upload a file” when selecting a product…. it shows up and seems to work but i cant find the images my customers have uploaded on my “orders” pages…. where can i find the images uploaded through the custome pruduct file uploader feature? i need to see them. you can find link to uploaded file an Edit Order page. I had setup 4 input fields at product. title for fields have different letter counting. May I have to change have input field title with input field in the same grid. For better explanation setup width for input field title for example 150px. Can product input field values be added to invoices? Hi! The “Required” input is still activated even if the “Enabled” check box is not ticked. Meaning, if I tick the “Required” and the input is NOT enabled, and I add the product to Cart, it acts as if there’s a missing required input and won’t add the product to cart. Please fix it. Also, I’ve sent TWO bug reports and no one has gotten back to me. Either with the free booster plugin or the paid option, is it possible to make it so a number input field affects the price? I’m trying to sell quilting services by the inch, so I’m hoping to make the number in the input field reflect in the final price, but not change the quantity and by proxy the shipping. Is there a way to export the product input fields on the order reports? I need to use the datepicker to enter the date of birth, I experimented several parameters. A good range for DoB would be 1916 to 2016 or anything like that. We would like the product quantity to be 6, and the calculated price with discount, to show up as a default surgestion. The costumer can also choose to by only one bottle of wine, but it would be preferable to handle six bottles. 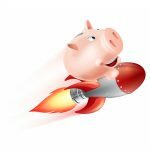 Do this booster for woocommerce offer that option? I have necessity of sequently of field text. Field 1 blank = not appear field 2, filed 3, etc. Hi, I have setted 2 product input field on some product..All seems ok, but in single product is showed only 1 input field instead of 2….How is it possible? I’ve checked all booster product settings and i don’t understand..
Can I put a custom name to the input that is generated, and not the default nomenclature like wcj_product_input_fields_global_1 ? In the latest round of updates with the release of Woocommerce 3, there seems to be some sort of change which now has removed the “Product Input Fields” customer inputs from customer email, invoice, confirmation page, etc. It still appears on the cart page with the inputs entered for that product. How do we add those back in the email and other places? This information is critical for customers to see through the process. Could you please check if this issues still exist in development version (https://booster.io/dev/). You will need to uninstall the old plugin version first (don’t worry your saved settings won’t disappear). Thank you thank you. Your post has just enabled me to stop and retain the little remaining sanity I have left. I have been going bonkers with hours spent on this issue too, trying to figure out where why and how it’s dropped out of emails and how to get it back in – my Input fields are the key data for saving time for the designer who receives the order emails. Hi Booster Support team, can you please advise on steps how I can also resolve this, as I am no developer and simply use a wordpress Woocommerce Booster pluggin – My skills only go as far as figuring out how to customise woocommerce templates using a child theme. This resolved the issue. The only thing is the field inputs are all on one line with the product name. It would be nice if they were broken out better and even a colon between label and value. Or perhaps the description text could be in a tab instead of to the right of the image ? Aha! With the aid of a few other plugins I’ve added an extra Buy button and stacked the fields down below the image. Is there anything that I can do to check the size of uploads but not lose the data that has been typed in for other input fields if the upload gets rejected (e.g. Too large)? I don’t quite understand how to use the checkbox. Where do you put the text that goes next to the box? Shouldn’t it use the “select/radio options” field so I could list a few options and users could check one or more? I only see a way to put a title and the checkbox itself. Am I missing something? When choosing Radio for the input field, Booster styles the radio buttons as checkboxes and separates the options with a br which is undesirable. Which Booster Plus file would I edit to change the choices from being on separate lines to displaying inline? This does not work with AJAX add to cart such as https://wordpress.org/plugins/side-cart-woocommerce/ or other AJAX solutions… any thoughts? Hi, when using file upload in a single product, an have multiple file upload fileds (3), the uploaded file is always the last one. As result, in the order and in the email attachments, the file is the same and not 3 different files!! Same here. Unlike the Checkout feature which allows multiple files to be uploaded, when on the product page, although you can add more than one file upload box, only one file is received. In my case it gave a numeric 25.jpg – same file for both even though it kept the file name of both files. Really needs fixing as it’s confusing having this at the checkout stage. I’m looking for a solution, but can’t figure out if it can be done: if a user buys multiple from the same products, I’d like an input text field that needs to be filled in for every product. Can this be done? I need to get a CSV or send the data to Google sheets. I can send orders to google sheets but it is not sending the product input fields. How can I get a list of orders with the product input fields? Can you help me with an invoice format when there are different tax rates like in India we have GST which further has 2 components- CGST & SGST. have. Instead of VAT% column, we should have CGST%, SGST% & GST amount. So basically the tax rates should reflect product wise in the invoice.I am unable to do so despite enabling the tax display option. Is there an option for the fields filled out before add to cart that they appear on the cart page? Using these Product Input Fields “O’Hara” becomes “O\’Hara”. Since we use these Product Input Fields for ordering printed badges with names this has become a little night mare. And since the Packing Slips template is HTML I cannot add stripslashes(); or wp_unslash() . Shortcodes weren’t processed in title, but we’ve just released new Booster v3.5.3, and I’ve managed to add shortcodes processing to product input fields titles (and placeholders) there, so it should be working now. Please let me know if there will be any issues or questions. Hi, how do I change the position of the Label to appear above the input textbox? Also I would like to make the textboxes the same size? can you explain where exactly you want to change the position with screenshots if possible, it would be easier to help you. Even better contact us on support@booster.io for further support. I have just discovered this plugin from a friend who recommended it to me. I am trying the product option add on facility and wondered where i could find out how to style the option. I am using a checkbox and they are all showing up centred and i would prefer them left aligned. Also how can i change the title and checkbox font sizes and margins. Is it possible to only show the Product Input Field only if a specific product variation has been selected? Product=Shirt, Variation=Plain, [does not show or ask for Product Input Field #1=First Name (Required), Product Input Field#2=Lastname (Required) on the Product page Add to Cart. I create the woocommerce product in php and want to set the input field values I have added. However, when I go to view the product the input field is empty? Please advise how I find what the product input fields are called and how to access them for updating ? The process I am trying to achieve is to add two custom fields to all products so that I can update with a Carrier Code and a Service Code when the product is created in PHP. I want to then access these fields after they have been added to cart and the user confirms payment to then create the shipment in 3rd party system using API. Please advise if product input fields is the best way of doing this? and if so, how I find what the product input fields are called and how to access them for updating and then reading the values? I have managed to figure out the solution. The data is getting stored correctly, for some reason it doesn’t show when you view the product on the website which isn’t a problem as these fields will be hidden from user anyway. Position on Single Product Page. I’m using the Ni WooCommerce Product Variations Table plug in to present variations as a table and with that the Booster Product Input field isn’t visible. Is it possible to move the position to an area outside a relationship with the Cart Button? Like maybe “After Product Short Description”? Thanks. more as exactly the same just about very incessantly inside case you protect this increase. I’m not sure I understand what you mean. Can you rephrase your question? Hi, I purchased your “Booster for Woocommerce” plugin but I am having trouble with some points that could be improved. For example, I would like to be able to choose the days that can be selected for “datepicker”. In my case, I would like my users to be able to click only on “monday”. Is this possible? Is it possible to have one input with multiple checkboxes? Also, is it possible to insert html in between inputs? Hi I bought the pro license to mainly add text input fields on products. But I really need some basic conditional logic is this possible? Unfortunately at the moment that’s not possible but we have added it to our to-do list. Do you have any updates about conditional logic? We could really use it. Is it possible to add a Text Product Input Fields and validate it to just allow 20 characters for example? Before i buy the product. I just want to hear if there is a limit to the number og files a customers can add to a ordrer? And the size limit here off. Customers can upload as many files as there are upload buttons on the checkout (1 file per field) which you set in the module settings. There shouldn’t be a file size limit. And there is no limit to number of Product Input Fields, pr product? I have to make sure that a customer can add 9 files and som text to a product. So how i understand it, that will need 10 Product Input Fields on that specific product. Yes, you should be able to create 10 or more input fields per product, including file uploads. I want to know if I can pass the value of a product input field by URL in GET method, so I can directly add the product to cart via URL. Is it possible to do that? Do I have to add some filter in functions.php or is there a GET parameter? Is there a way to change the text input field (not text area), so that it is just 1 line high instead of the deafult 2 lines. I have a product where i need 16 cusomer inputs (A mix of files and short texts), and i would like to compress it as much as possible. Can you contact us at support@booster.io with a url to your website so that I could see how it look like on your website. Text product input field (not textarea input field) should be one line only and should not allow pressing enter to go to next line. Can we set up check box by Sunday တ န ဂၤ ေႏြ | Monday တ န လာၤ | Tuesday အ ဂၤါ ? Or regarding your setting, do I need to use 1 field 1 check box? Could you clarify what you are trying to achieve? 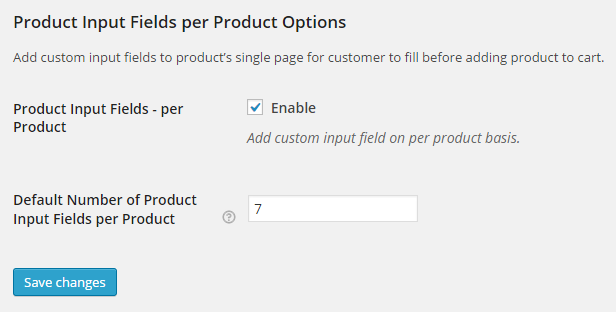 To enable check box in product field, do I need to create 1 field for 1 check box option? Unlike radio, I cannot set 1 line 1 choice? 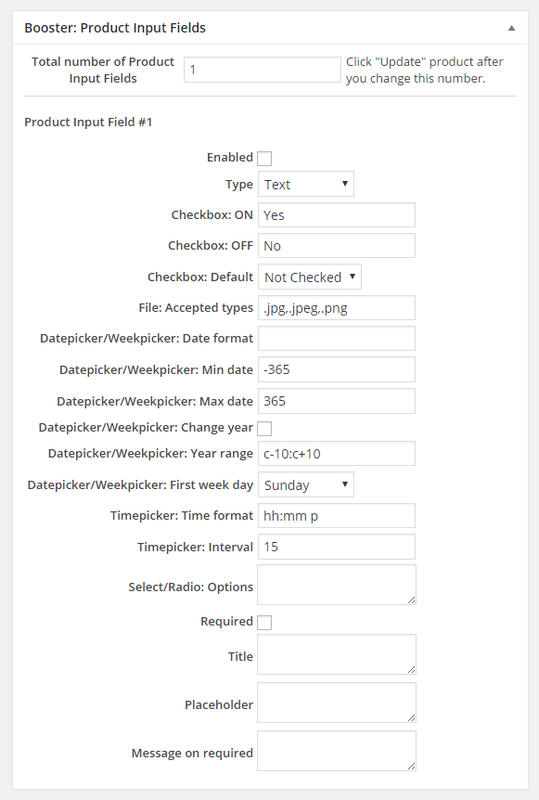 I am building check box field for, Sunday, Monday, Tuesday, Wednesday, Thursday, Friday, Saturday. To get check box for Sunday, Monday…ect…. one field for Tuesday…etc etc???? No, unfortunately checkboxes cannot be set the same way as select or radio options (i.e. 1 per line); you should create 7 separate checkboxes. Can you make the check box function to be better in next upgrades? It is taking too much time to create fields. More over, once the field number is over 40, I have an error saying, the link you followed is expired! Can you please tell me why this occurred by your experience? Is it because the file size becoming bigger than 33 Mb (max accepted size by WP)? We have added your suggestion to our todo list. About your issue, could you try increasing the memory limit as described in our FAQ page – https://booster.io/frequently-asked-questions ? If this does not solve your issue, please contact us directly at support@booster.io. Thank you. Hello! Is there a way to increase the default size of the product input field box? You could use custom CSS code and write it into “Custom CSS” module. 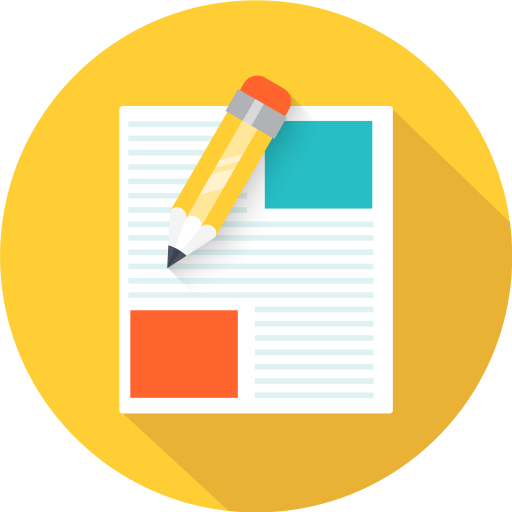 If you would like me to write some for you, please contact us directly at support@booster.io with url to your website.